I Still Watch VHS, So? I have a bunch of VHS tapes in Japan that I brought with me when I first came to this country a gajillion years ago. I *finally* got a DVD player when I bought a PS2, but for a while, it was VHS only. Really like my VHS tapes — the heavy, analog picture quality, the cardboard boxes, the plastic cassettes. A lot of them are stuff I can't really find on DVD here. Stuff like Whit Stillman movies. 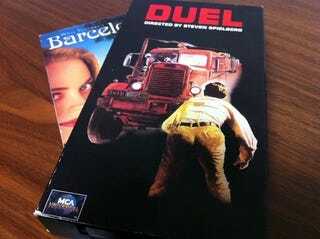 I'm sure you can find Duel in Japan. To be honest, I've never looked. Often pull out the VHS tapes and pop one in. The kids seem to prefer the VCR to the DVD player as it's a little easier to operate and VHS tapes are kid friendly. Well, that is, unless they pull out the tape... Or stuff toy cars in the VCR. Both of which have happened!